You know you are on the right life path when you wake up in the morning eager to go wherever you’re supposed to go. You know you are on the right life path when you are surrounded by people who share your enthusiasm and passion and who keep surprising you every day. You know you are on the right life path when you spend all day carrying a stripped eggplant in your bag, brought to you by a new friend, who somehow knows you all too well and knows how excited you get with foodstuffs you’ve never seen before! You also know you are on the right life path when you have exciting news to share! Dear reader, my first piece of work has been published by Love Your Larder! http://goo.gl/ONAZb. More to follow, every week! I couldn’t believe it when I read the “food anthropologist Nafsika Papacharalampous”. It is strange, but seeing it written somehow made it more real. I am no longer a Financial Analyst; I am a Food Anthropologist. And although the Financial Analyst title never felt right, this one does. The period of liminality is officially over. 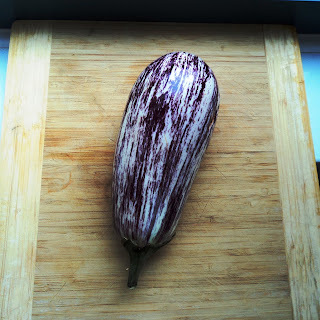 I am a Food Anthropologist, living in London now. Embracing my new identity, I went to Borough Market yesterday to do research for my next article and brought home the most interesting carrots. Did you know that carrots can be white or purple-orange? They are now cooking quietly in the oven with butter and truffle honey. Very curious to try them! 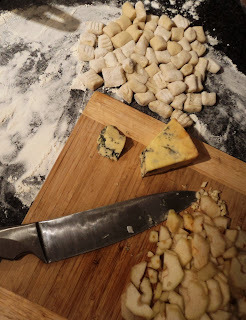 Inspired after Borough Market, I made fresh gnocchi for the first time and was very proud of myself. I am not sure if they taste as they are supposed to, because they did taste differently than the store-bought ones. But they were quite good so I was satisfied. To make the sauce, I used a recipe from Jamie Oliver’s magazine which looked very interesting. Well, interesting as it turned out, was an understatement: Frying pan. Butter. Garlic and sliced pear. Soften. A dollop of double cream. Stilton cheese (any other blue cheese I think will do). Melt. Black pepper. 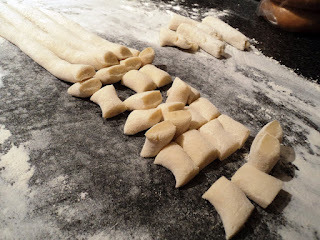 Mix with gnocchi. Die from pleasure. The sweetness of the pear, the sharpness of the Stilton, the discreet hint of garlic, all blend together in a bold combination that guarantees to take you to heaven. Pair with red wine and you’ll want nothing else from life. Wondering how I hadn’t encountered that combination before, I woke up this morning still thinking about those flavours. I wonder if that sauce would go with a nice medium-rare beef fillet? Something tells me yes. Or in a tart with a flaky puff pastry? Hm…Can’t wait to get some more cheese tomorrow and experiment! White gnocchi in a white sauce, with the city of London covered in white. Enjoy the silence of the snow dear reader.